There is no other community like the River Hills Plantation in the Carolinas or perhaps anywhere in the country. Located on the shores of Lake Wylie, a near eighteen miles south of Center City Charlotte, North Carolina. Designed with foresight by Sea Pines of Hilton Head, the River Hills Plantation is an ideal community for casual Southern living. Enjoy all the benefits of Charlotte with the bonus of a secure resort-like location, low South Carolina taxes, and top-rated schools. The River Hills Plantation is a unique gated lifestyle community which features 24-hour private security and a staffed gate house. Lush mature trees help frame the River Hills Plantation's serene natural beauty, which is unmatched by any neighborhood in the greater Charlotte area. A preview of the River Hills Plantation’s charm starts with a drive up the magnolia-lined entrance road, complete with a seasonal greeting from the horses stabled at YMCA Camp Thunderbird. With a friendly wave, security greets residents from the gate house as they enter the eight hundred-plus acre neighborhood. River Hills Plantation residents live with the security and peace of mind of knowing that added precautions have been taken to protect their families and homes, preserving the serenity of their neighborhood. 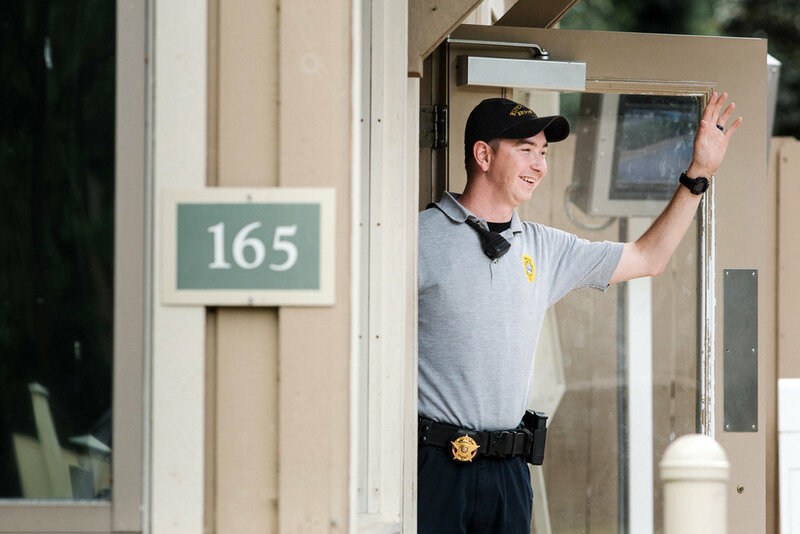 The 24-hour staffed gate house and patrolling officers act as a deterrent and keep the neighborhood safe from outside intrusions and incidents. Officers extend a warm greeting to visitors and are helpful throughout the neighborhood and Lake Wylie community. The River Hills Country Club is a center of social activity for the community with residents enjoying one of several types of membership tier options. This private club features a top rated 18 hole golf course which takes advantage of the natural terrain found in the River Hills Plantation. Additional amenities include a tennis facility featuring 10 courts (8 clay and 2 hard) complete with a pickle ball setup, 3 swimming pools, a workout center, and full service dining facilities. Community Garden plots are available for the resident garden enthusiast. Our climate allows for year-round and seasonal opportunities for growing fruits, vegetables and flowers. Our year round, full service marina is proud to be Certified Green. It features 209 covered slips, a ship store, and a galley snack shop. It's easy and fun to keep your boat right near your home! The centrally located playground offers something for all. There is playground equipment suitable for toddlers and elementary age children; including swings, slides and climbing structures. A full size basketball court provides entertainment for all. Open from dawn to dusk; residents gather for "Yappy Hour" daily at 4:00pm to meet other dog owners for doggy playgroup. Is located on the water's edge of Lake Wylie and is made up of over 3 acres of protected land. There are plenty of picnic tables and benches to enjoy the view of the lake. Additionally there is a sandy beach, stocked fire pits, playground equipment, and restrooms. Southpoint Park is available for resident use year-round. 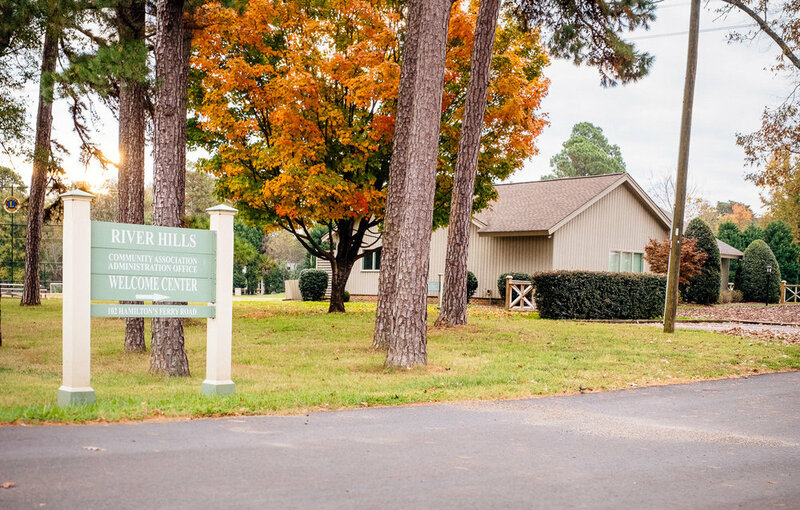 The River Hills Plantation community association office functions as the community’s town hall. This office is fully staffed and operated by the homeowners association and works in conjunction with community’s elected representatives. The association manages the day-to-day operations, the community infrastructure and landscaping, architectural review details, communications, and organizes neighborhood events (such as a food trucks, car shows, ice cream socials, and many holiday events). Camp Thunderbird is for boys and girls (ages 6-15) and provides the ideal backdrop for trying new things, making new friends and fun. The River Hills Plantation/Lake Wylie emergency squad is a source of pride for community residents. Two ambulances are stationed at the squad training center, located at the River Hills Plantation entrance. The crew is both 911 and heli-ambulance linked. The River Hills Plantation / Lake Wylie EMS program is privately funded (with help from the River Hills Lions Club) and does not charge for their services.